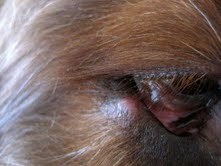 This past week Murphy (4 year old Irish Setter) developed what I thought was a small stye on his lower eyelid (beneath the area that touches his eye). It was not bothering him and was the same color as his fur (perhaps a little lighter). Over the past day the stye has grown a bit and is now a pinkish/red tone. It still does not appear to be bothering him although he is tearing more from that eye than the other. There appears to be a tiny black bump on the rim of his eye right above where the lower bump is. I was wondering if this might be a blocked tear duct. I can send you pictures immediately as well if that would help you. I can take him to my vet first thing on Monday but am anxious that he could develop cherry eye if this isn't seen to immediately. Any advice you could offer would be greatly appreciated. Thanks for your question. I'd love to see some pictures! I'll send you an email that you can respond to to send me pictures. Once I've had a look I'll give you my thoughts. I'm in between appointments this afternoon so it may be a few minutes but really shouldn't be too long. Thank you for your quick response. I am sending the photos in their original large size (if they are too large for your operating system please let me know and I will re-size them). The area that is enlarged is beneath and not touching his actual eye (looking at the photos from the angle I took them it looks as though perhaps it is touching his eye, but the bump is a few millimeters beneath his lower eyelid). I have done a few warm compresses to the bump at the direction of a local emergency vet I spoke with on the phon) these did not seem to bother Murphy and have not changed the size of the bump. I forgot to mention previously that Murphy has atypical Addison's disease and takes 1/4tsp of Tylan powder on his food each night as well as a .5mg pill of Dexamethasone each day for a gluten allergy and his atypical Addison's. Since being diagnosed by a previous owner's Vet (he is a rescue) he has had normal blood tests and regular/normal stool for the past 2.5 years since I have owned him. He's a big boy and weighs 79lbs. The atypical Addisons's doesn't appear to contribute (presently) any issues to his overall health. Thanks so much for looking at these. I look forward to hearing your thoughts. Thank you for the excellent pictures! Keep in mind that my advice here definitely can't take the place of an in person visit with your vet. However, I can give you my opinion based on the pictures. My first thought is that it is unlikely to be anything too serious. What is swollen in his eye looks like a meibomian gland. Sometimes we will see lumps that form in these glands. They are called a meibomian gland adenomas. These lumps are never cancerous and we don't usually remove them unless they are really bothering the eye or if they are getting really large. However, from what I can see from the pictures, I don't think these are actually a lump. Rather, it looks like the gland itself is swollen. This could be from a mild infection in the gland. Sometimes these will go away on their own. It is a good idea to continue the warm compresses if he is allowing it. However, if the bump has not decreased in size by after the weekend then it would be a good idea to have your vet take a look. They may prescribe an antibiotic to put in the eye, or they may prescribe an oral antibiotic for him. In theory it is possible for this to be a tumor, but in 12 years of practice I don't recall seeing a cancerous tumor affecting this part of the body. Thank you so much for your thoughtful reply. You have put my mind at ease until Murphy can see his regular vet on Monday. I was more concerned that it could have been a form of conjunctivitis or that his third eye lid could have an infection that would lead to cherry eye and the need for surgery than anything else. Now that I know he is not in any immediate danger we will enjoy our jaunt to the park much more this afternoon. From what I can see on the pictures it is not actually his third eyelid that is affected but rather his actual eyelid. 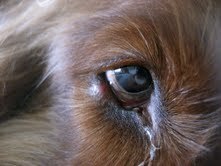 And just for interests' sake, an infection does not lead to cherry eye. 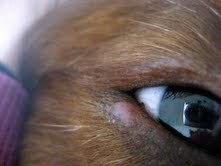 Most dogs with cherry eye have it because they have a genetic predisposition for it. Have a great time at the park!